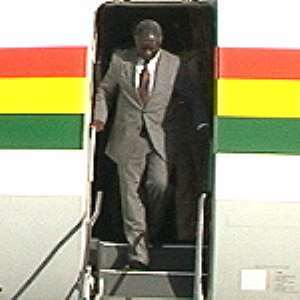 Accra, June 21, GNA - President John Agyekum Kufuor returned to Accra on Monday from Ouagadougou, Burkina Faso after attending the opening ceremony of the African Union (AU) Sub-Regional Summit on Water Resources Management, Biotechnology and Agricultural Productivity. Nana Addo Dankwa Akufo Addo, Minister of Foreign Affairs, Mr Kwabena Agyepong, Presidential Spokesperson and Ambassador Daniel K. Osei accompanied President Kufuor. President Kufuor went to Ouagadougou from Abuja, Nigeria where he attended Mini-Summit of Economic Community of West African States (ECOWAS) Leaders0 to discuss the way forward in the political situation in La Cote d'Ivoire. Dr Kawme Addo-Kufuor, Minister of Defence, the Dean of the Diplomatic Corps, Ibrahim Omar and the Inspector General of Police, Nana Owusu-Nsiah as well as some officials of the Ministry of Foreign Affairs met President Kufour on arrival.